How To Hold a Guitar Pick | Zing! 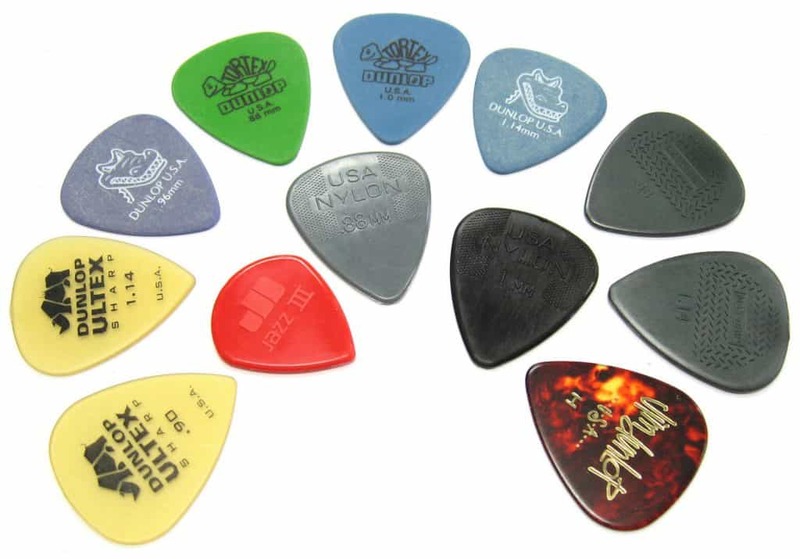 Picks (also called plectrums, plecs, plucks or pluckers) are used for a wide variety of reasons. Sometimes, they are used to produce a louder, more rocky sound than can be achieved using your thumb and fingers. Other times, they are used to enable fast picking, on one string or on multiple strings. Picks are absolutely essential in styles such as heavy metal or shred guitar. 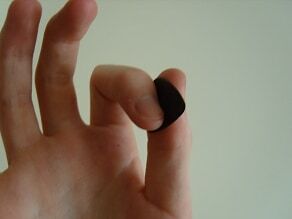 Often, picks are used for strumming chords, as using your fingers to strum can be painful and lacking in volume. Although you can get by playing without a pick – and some beginners are adamant that they prefer to play without one – picks are considered essential by most players outside of the classical genre. What are Picks Made from? Do Different Picks Alter the Sound? In order to understand how picks work and how to hold them, we need to know a little about how guitars produce sound. Guitars make their music as the force from picking or plucking causes the strings to vibrate, creating sound waves. On an electric guitar, these are then picked up by ‘pickups’, which route the signal to an amplifier. On an acoustic guitar, the strings’ vibrations go through the top of the guitar, to the back and then out again through the hole. For this reason, you should hold your pick at a slightly rotated angle, encouraging the strings to vibrate inwards towards the guitar. This enables a fuller, richer sound than if you play with a pick at a flat angle. Picks come in a range of thicknesses, from 0.40mm to 3mm. The heaviness of a pick has an impact on the sound: lighter picks sound brighter and heavier picks darker. Heavier picks can also make rhythm guitar playing sound a little muddy. Thicker picks are significantly easier to play lead guitar with, as they enable you to get a sturdy grip and to control where the pick is going as though it were an extension of your own finger. Thin picks are preferred by acoustic guitarists as they are easy to strum with and flexible enough to make the rhythm flow freely. However, thin picks often wear out and/or break more quickly than thick picks, for obvious reasons. As well as being available in different thicknesses, you can also get different sizes and shapes of plectrum. The most common shape and size is the standard shape, which is approx 30mm tall 25mm wide at its widest point. However, jazz players often like to use picks which are a bit smaller: approximately 26mm tall and 23mm at the widest point. There are also pointy picks, for extra precision, equilateral picks to make life easier for some beginners, and teardrop picks which are like a slightly smaller, pointier version of a jazz pick. There are a few different materials that picks can be made from with some truly random sounding names! Celluloid picks are common and cheap, which is probably one of the main reasons they’re so popular. You can often find them in bargain buckets in music shops, and these are the kind of picks that often have cool/quirky designs on them. They wear out faster than some of the more expensive picks. But, if you’re the kind of person who loses them all the time anyway (aren’t we all? ), then this budget-friendly option might suit you just fine. You might have spotted the more expensive option in the music shop or online: the picks with a little tortoise on them. ‘Dunlop’ picks are made from Delrin, which is very durable and certain to last a lot longer than celluloid picks. Providing you don’t lose them! Delrex picks have a chalk-like appearance and are very easy to grip. They’re often available in the thicker sizes, and prove to be popular with heavy metal players. Ultem picks are very stiff and designed to be similar to tortoise shell, though more sturdy. They do produce a clearer sound than some other picks, so acoustic players often choose these to enhance their playing. Nylon picks come in a huge variety of thicknesses, from the extremely thin – 0.40 – right up to 3mm! They also often have a non-slip texture which means you don’t have to worry about your pick slipping from your fingers. 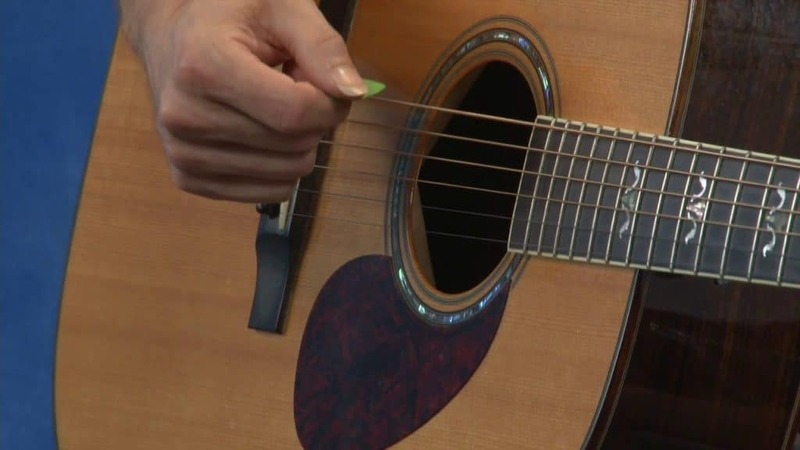 Wooden picks are sometimes used to bring out ‘truer’ tones of single notes, as there is less pick-noise than plastic products, and the wood helps to bring out a warmer sound. They can, however, be a bit hard on the strings. Metal picks can be even harder on the strings. They are likely to snap your strings and to scratch your guitar. Needless to say, they’re not extremely popular. However, they can give you an aggressive attack and a bright sound which might be exactly what you’re after. In a word, yes! The thickness, shape, size, and material will all have an impact on the sound of your guitar. If you use the cheap, celluloid picks, you might get some ‘flapping’ sounds, whereas, if you use wooden or Ultem plectrums, there will be none of this. Metal picks can be very noisy to use but can also provide bright tones, if you use them with care. The grippy picks made from Nylon or Delrex are great for performance but in a recording situation, you might find that they produce a bit too much pick-noise for your liking. Of course, you might like pick-noise, but if you don’t then a smoother feeling pick might be the best way to go when you’re in the studio. So, now we know which pick we’re using, it’s time to figure out how to hold a plectrum. As we established earlier, ensuring that the pick attacks the strings at a slight angle is advised, for sound’s sake, but there are a couple of things to consider for playability’s sake. The most common way of holding a pick is between the thumb and index finger, the same way as you’d hold up a piece of paper. When you have your pick between your thumb and your first finger, it probably feels natural to close the remaining three fingers into a fist-like shape. 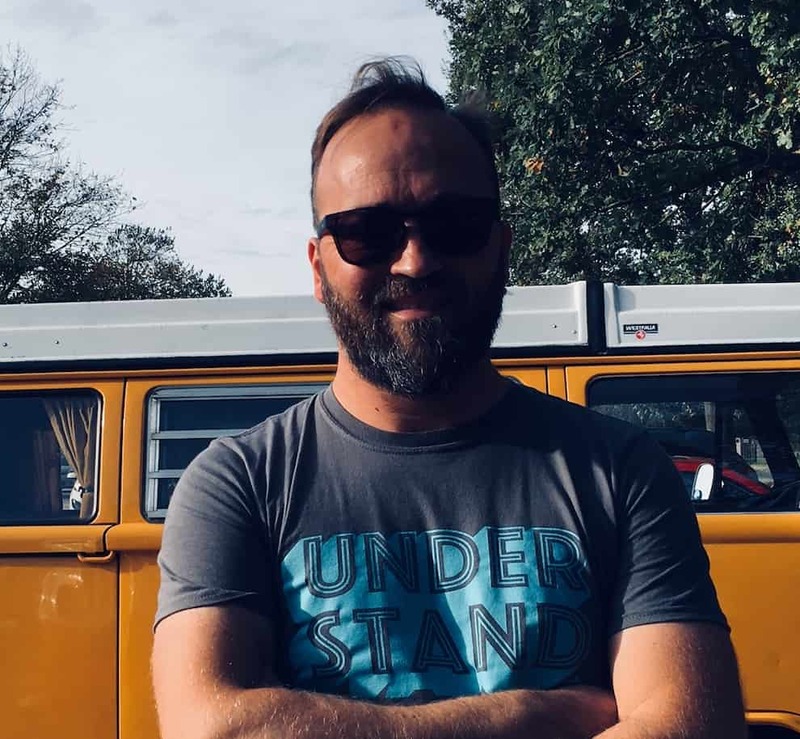 This is fine; it enables you to move your arm in a natural kind of way and encourages good rhythm as you move more of your body with the beat. 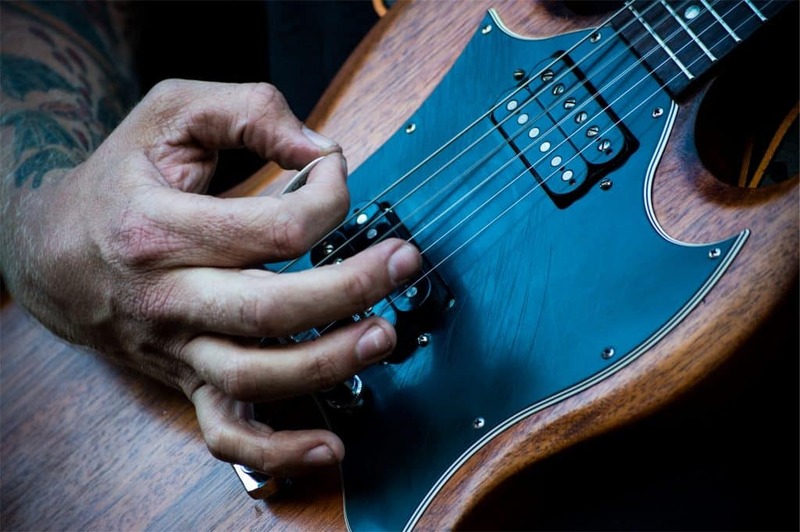 Ensure that your fist is not completely closed: it should be loose and comfortable, and this extended ‘O’ shape that your hand creates will serve you well for rhythm guitar playing. If you’re more of a lead player, you might prefer to opt for the ‘OK’ shape. 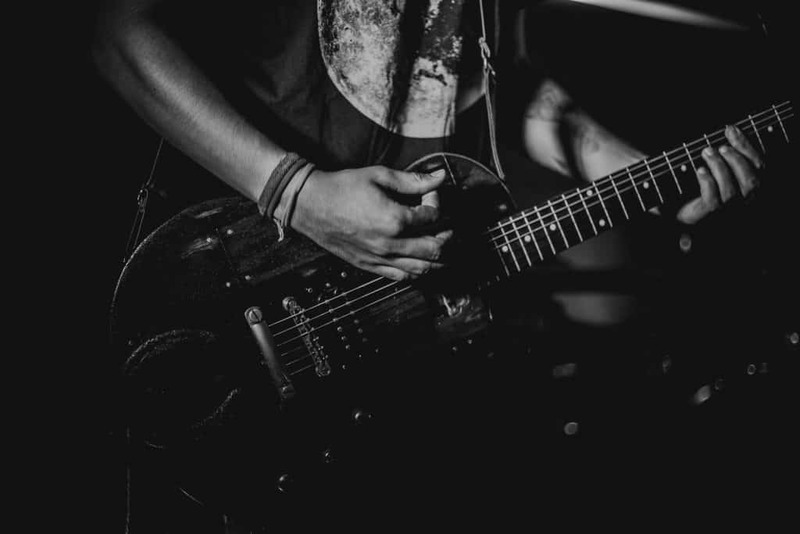 This involves the three remaining fingers sticking out, giving you more control over which strings you pluck, and encouraging fast playing which is controlled by your wrist. When you’re strumming with a pick, in the elongated ‘O’ shape as seen above, the lower half of your arm should be guiding the strums. This will enable you to get into a natural, rhythmic flow, and will also encourage a good angle to get a rich sound. Try out some strumming patterns with this pick hold, enjoy the flow! When picking with a pick, you might want to play fast stuff. If this is the case, it will mainly be your wrist that is controlling the movements, not your whole arm. Additionally, you will benefit best from down-up picking, otherwise known as ‘alternate picking’, if speedy lead is your aim. It can feel weird at the beginning, but alternate picking is something well worth spending some time with. Sure, it feels more natural to go down-down-down-down to start with, but that will both slow you down and wear you out. If you’re playing some speedy licks or riffs, try going down-up-down-up with your plectrum, and hear the great results as your practice pays off. Something else to practice is alternate picking your scales. And it will enhance your fretboard knowledge at the same time. Bonus! Of course, alternate picking isn’t always the way to go about playing a piece. Sometimes, it will make sense to go down-up-up-down when playing a lick or a riff. Deciding how to pick usually requires a bit of foresight and knowledge of the song you’re playing. In extremely speedy cases, sweep picking might be required. This is when you ‘sweep’ with the pick across the strings to play separate notes at super-speed. This is used by people like Yngwie Malmsteen, and is a great way of practicing your arpeggios and/or making teenage boys’ jaws drop. There is a technique called ‘hybrid picking’, which involves a combination of using your pick and your remaining three fingers. It’s been used by the likes of Glen Campbell, John Butler, and Buckethead, and it allows you to hold onto your pick whilst playing passages that require finger-style playing. Although they’re not technically essential for guitar playing, picks are highly recommended when you’re leaning towards the rockier genres. Now you know how to hold a guitar pick, your lead and rhythm playing will be clear, loud and comfortable. One of the most important things is to be in control, so it’s important to hold your pick quite far down, leaving only the point showing. This is particularly relevant in lead guitar playing, but also when you’re strumming, so that it doesn’t go flying out of your hand! Something else which can keep picks in your hand is the grip feature available on Nylon or Delrex picks. You might think it’s unnecessary, but your hand is likely to sweat on stage. This anti-slip feature can make or break a show. You can choose which size and thickness you would like to use, according to the genre you play and the kind of attack you want on the strings. There are big ones, small ones and some as big as your head (almost).